Hot Tubs Reviews: Fun and Affordable Hot Tubs and Spas! What is the best hot tub for a home? After doing some research online I was able to find a few of the cheapest hot tubs and spas being sold right now! Almost all of them are portable and perfect for a small space as well! *The one you see on the picture above is a very cute portable spa for sale! Easy to put together, less than 20 minutes! You get in, close your eyes and let the awesome massage jets melt all your stress and aches away…. The water is extremely soothing…. This can be your reality every day, (minus the stress and achy body) when you have a nice hot-tub at home! But which one is the best one to have at home? I hope you are able to find a gorgeous hot tub or spa for you and your family here! The first question your need to ask yourself before buying your dreamy hot-tub is the most obvious one: How much can I afford? The second question is: How many people will be using the hot-tub on a regular basis? And the final important questions: Where can I install my hot-tub? How much space do I have? The ones for six people or more will usually cost more than 3,000 or 4,000 thousand dollars. It looks very cute and it doesn’t take up a lot of space either. It has 12 therapy jets and it’s super easy to install, that’s why it’s called ‘plug and play’. It is absolutely perfect for two people, it’s very roomy, but it will also fit four adults, but with less room to move. This hot-tub will also ship for free, which is a super money saver as well and two strong men can carry it to where it’s going to be. Overall, it’s a highly recommended plug and play hot tub for sale! Check it out here! It looks super awesome and very inviting! 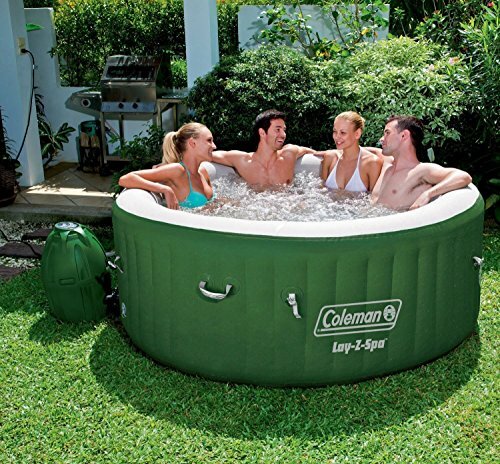 Coolest Portable Hot Tubs for Sale! I am a huge fan of these cute portable hot-tubs for sale! Second of all, like the name says, they are portable! You can put them anywhere you want and then later on if you feel like it, you can place them somewhere else! This is a cute, fun and CHEAP portable inflatable spa for sale! I love the fun color! Perfect for a romantic evening! I bet you can see yourself relaxing in there already, can’t you? It has awesome bubble jets that will give you a nice and relaxing massage! 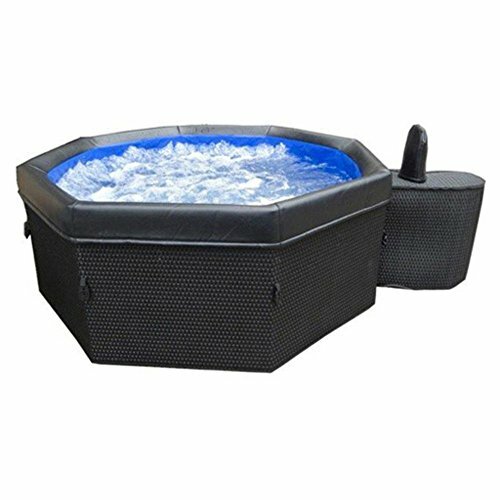 This is one of the cheapest best portable hot tubs for sale! It is very cute and it fits two people perfectly and up to 4 adults inside! Very easy and fast to assemble, you won’t need any tools and will take you less than 20 minutes! Most buyers are very happy with their purchase. They say the water will stay hot for approximately 15 minutes. I think it will make a wonderful anniversary gift idea! *BEST INFLATABLE HOT TUBS For Cheap! 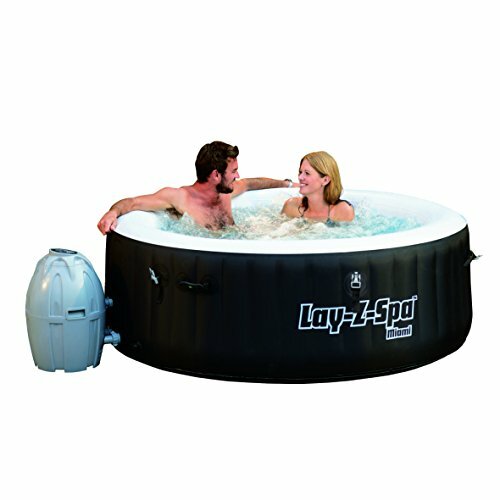 It’s called ‘Lay-Z-Spa‘ and it fits 4 adults inside! Some users even place it indoors, in front of their TV!! *Here it is! Take a peek! 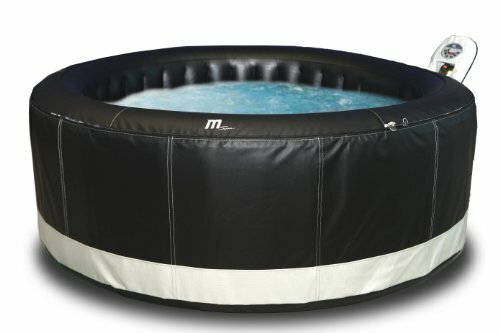 Best Inflatable Hot Tubs for Sale! This is a super gorgeous 6-person inflatable hot tub for sale folks! It also has bubble jets! The water capacity is about 245 gallons! As you can see in the picture, it has a beautiful and very strong black crocodile pattern cover! 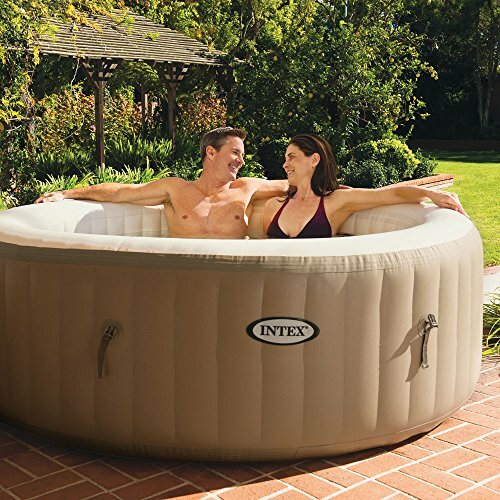 Definitely among one of the most spacious inflatable hot tubs in the market! Of course I would never forget to include this cute and very affordable Intex inflatable hot tub with bubble jets for sale! This cute ‘spa’ fits up to four people inside and it has amazing high-powered bubble jets! It takes about 20 minutes to set it up and start enjoying! It is a sturdy tub and the walls hold up pretty nicely! 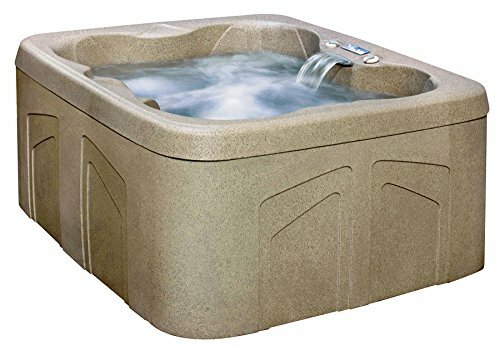 Overall this is a great affordable and portable inflatable hot tub spa for the money! It’s about the price of a laptop computer! *Here is a nice look of this cool PureSpa inflatable hot tub! Check out the cool bubbles! Hello gorgeous dark chocolate wicker hot tub for a lucky couple! Just by looking at this picture I want it! It has a nice ‘turbo wave massage’ function that will relax you and give you something to look forward to every day! The dark chocolate color is absolutely gorgeous and it’s also ‘plug and play’! These are very useful videos explaining everything you need to know about properly maintaining your new hot tub! *Hot Tub Water Care: Chlorine or Bromine? *I hope you were able to find the best portable hot tub for your home here today!